NOBUYUKI ARAMOTO. 'The new generation'. By John Cheetham. Black-Belt or 'Sensei'. By Mike Clarke. KYU SHO JUTSU - Replacing the missing elements. By Vince Morris. MAE GERI - A technical breakdown. (Demonstrated By SENSEI Y. OSAKA). JIM WOOD 5th DAN J.K.A. 'Japanese dojo in Scotland'. By George Carruthers. CYRIL CUMMINS 5th DAN K.U.G.B./J.K.A. Blackpool Course. SHU-HA-RI 'The way of nature'. By Mike Clarke. SENSEI MASAO KAWASOE Visits W.T.K.F. North Wales Course. 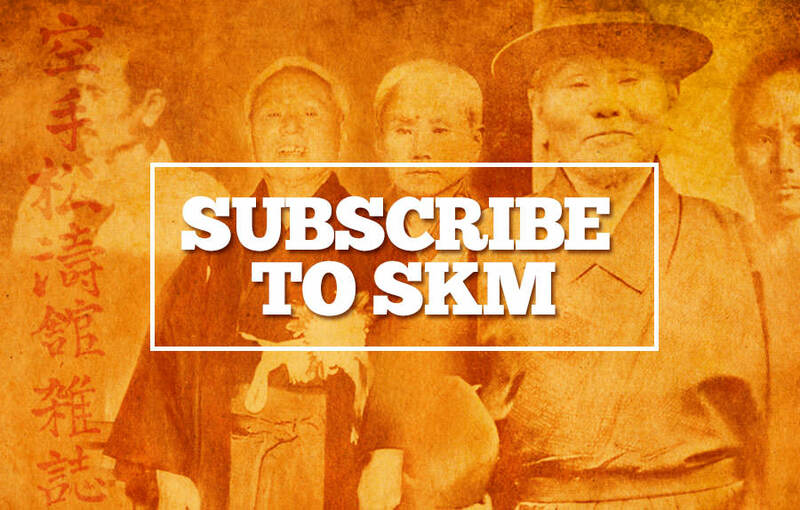 This issue marks the eighth year of publication of S.K.M. and I'm more than happy to report that even in the present economic climate and times of recession, that the magazine is actually going great guns and new personal subscribers and clubs are joining us all the time. The thing I like most is all the letters saying that S.K.M. is really 'the' only truly TRADITIONAL magazine. I don't feature many Championships, I hardly know anyone who's interested in that anyway. I don't have anything to do with Martial Arts movies or films that may have a few fight scenes. How can that be for anyone who's 'serious'. As Sensei KATO said about Jean Claude Van Damme, "He can only kick off one leg." I hopefully, like you, am simply a 'student' of Karate and in particular SHOTOKAN Karate which I feel has everything if you look closely enough for it, including close-range, grappling, throws, etc. Everyone seemed to enjoy Vince Morris's article in the last issue. His follow- up this time is also very interesting, although I do disagree on one point. Vince says you get less effective in your techniques with age. He should go and train with Sensei KASE or Sensei ASAI, both well over sixty, but that's my opinion. This is what it's all about - OPINIONS. We should all be able to take constructive criticism. I get on really well with Vince and think his articles are brilliant, but I don't have to agree with everything he or anyone else has to say. I know his stuff is field tested and amazingly effective, this is a fact. Whether or not he's HISTORICALLY accurate is another question. Who 'really' knows? I've had people phone me in 'confidence' and say he's talking a load of nonsense. Also letters saying that he's jumping on the George Dillman bandwagon, but the letters are always 'NOT FOR PUBLICATION', which is sad because it's just a matter of OPINION. I'm definitely going to get him down to my dojo for a course. I want to have a good look at this VITAL POINTS theory. I personally am very interested in effective techniques, but also and equally if not more importantly, I want to stay in really good condition and try and develop a fluent Karate as I get older and for me, the J.K.A. basics are the key to finding that. It's a case of everyone to their own 'WAY'. I'm really pleased with this issue and believe me I am my own worst critic in everything. I don't pretend to be a 'SENSEI'. I'm not. I'm a student of SHOTOKAN just like all of you. I keep training and trying to improve and hopefully through S.K.M. pass on useful information about our style of Karate-do. Also allowing many different VOICES' to be heard, not only from the U.K., but from all over the world. There are, however, still closed minds amongst us, and unfortunately they often belong to very 'senior' instructors who for numerous reasons don't like their students hearing these voices. I believe this attitude is detrimental to the overall progression of these students who are quite often kept in the dark for years, both technically and politically. Politics in Karate is sad, but it's there! Open courses should be encouraged by all senior Instructors, they bring us all together and do promote UNITY, FRIENDSHIP and the positive sides to KARATE. Remember - there's nothing more SERIOUS than FUN.